In the wake of the 2008 financial crisis, Congress passed the Dodd-Frank Wall Street Reform and Consumer Protection Act (Dodd-Frank), overhauling the financial regulatory system. Congress required the U.S. Securities & Exchange Commission (SEC) to develop a whistleblower rights program to incentivize people to report potential securities law violations. The SEC adopted the final rules governing this program in 2011. The person must “voluntarily provide” the information at issue. The successful enforcement action must lead to “monetary sanctions exceeding $1,000,000” in a single judicial or administrative action. If all four conditions are met, then a whistleblower is entitled to an award. Under the law, the amount of the award can be anywhere between 10 and 30 percent of the sanctions collected. The award amount is in the sole discretion of the SEC. No one should be punished for doing the right thing, especially those with the courage and integrity to blow the whistle on corporate fraud or other illegal activities. 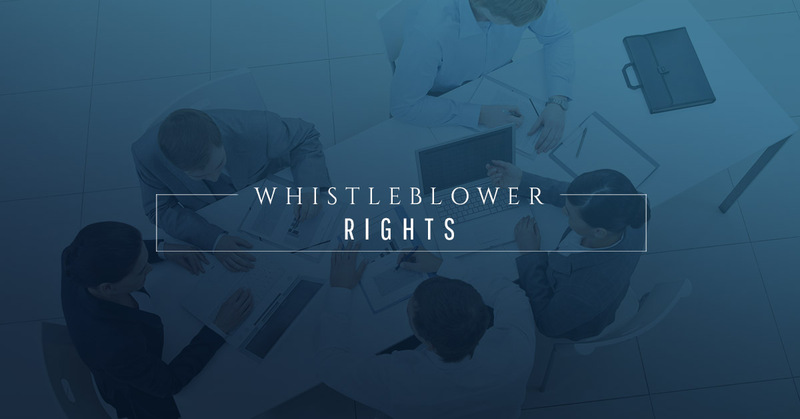 There’s a wide range of whistleblower laws designed to protect you. Whether you have suffered retaliation because you did the right thing and spoke out when your employer violated the law or acted improperly, or whether you have information but are afraid to speak out, our firm is here to help. Our attorneys are experienced in representing employees who have blown the whistle and reported fraudulent or improper practices. Please contact us to discuss your case.